Furnished in traditional island style furniture, the living room, formal dining room and bedrooms will give you the flavor of old Hawaii. We are just a short walk to the quaint Cowboy town of Makawao, and 15 minutes to Paia and Ho'okipa, the internationally-renown windsurfing mecca of Maui's spectacular north shore! On the cusp of the wet and dry sides of the island, the Banyan Tree House usually is bathed in sunshine interspersed with occasional rain showers and heavier tropical rain. In the surrounding hills you have the finest hiking, biking and horseback riding on the island. There are two golf courses in the area. Telephone, fax, wireless internet and laundry facilities included on the premises. Most of our guests remark on how beautiful and relaxing the property is. Wide open lawns that are surrounded by sprawling old trees and flower gardens all help create the ideal restful atmosphere. A panoramic view of the north shore and west Maui mountains from the pool and lawn area. (3) 2 are shared for all cottage guests, another is in the Plantation House. All units have 1 refrigerator. The plantation house, Sue's and gardenia cottages all have full size refrigerators. Most units have a deck or patio. 50 ft. swimming pool shared with all guests of the Banyan Tree . The outdoor jacuzzi is next to the pool overlooking the north shore and west Maui mountains. Shared with all guests of the Banyan Tree. We had our whole family of 22. This consisted of 5 adult married children with all their children. The grandchildren ranged in ages from 3 to 27. The way this property was laid out suited us perfectly We took up the whole complex. . Marty was on site for any of needs and or concerns. The main house afforded lots of places to gather, from playing ping pong in one room to card games in another and sitting with one another to just talk or read quietly. We had our 4th of July BBQ by the pool and a bonus when night time came the next door neighbor shot off professional looking firecrackers. We learned he made them as a hobby. I'm sure that would not be promised every year. We got lucky!!. The kitchen had everything you could possible need and then some. The beds were comfortable, several washing machines and dryers, We lacked nothing..
My extended family rented the main plantation house and two separate cottages. There was more than enough room for the fifteen of us ranging from grandparents to parents to teenager to little ones. We have rented many homes through VRBO, and often have issues with space, so we were so happy to have such a big house with so many beds and bathrooms to spread out in. The home is very charming. If you are looking for the fancy resort lifestyle that Hawaii can offer, then this may not be for you. If you are looking for a quiet retreat, then this is perfect. The location is centrally located and a short-ish drive to the beach. We enjoyed the pool and hot tub every day. There is a large kitchen that is equipped with anything you need to cook - there was even a coffee grinder and slow cooker. We took full advantage of this and cooked every day. There is a grill, as well, and Marty even dropped off fresh bananas and avocados grown on the premesis. If you want to go out, the home is a short walk to the charming town of Makawao, which has restaurants and coffee shops and a bakery. The home is a little out of the way, so you will need a car to get to Hawaii tourist sites. At the end of our busy days, we were always so happy to come back to the house to relax. I would recommend (and already have) to anyone with a big family. We had a wonderful time. Up-Country Maui at its BEST! This house was just AMAZING!! The pictures do not do it justice. A lot of times on sites like this- the pictures make a property look better and this is NOT the case. We were in town for a wedding and four separate families stayed on this property and there was plenty of room! We enjoyed making breakfast in the commercial kitchen and BBQing dinner out by the pool. Speaking of the pool- we used the pool and hot tub daily! 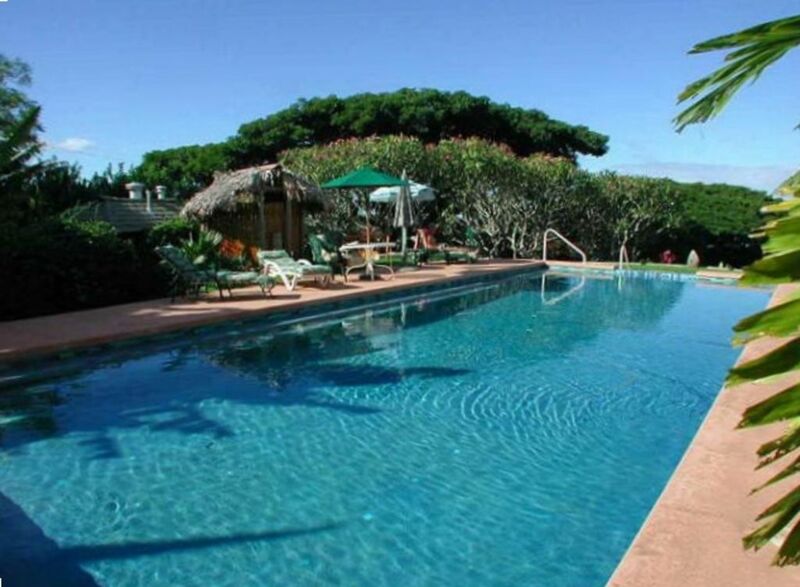 This property is just a couple minute drive to the town of Makawao and about 20 minutes away from the Airport. If you are going to Maui and would like to get away from the resort life this is the property for you! Next time any of us are going to Maui we will be staying here! It was a perfect setup for our family of 10.
morning repast that was provided was ample. The owners are helpful, friendly, and met all our needs and requests without hesitation. The property is gorgeous, situated at a cool elevation and off the main highway. Except for the occasional chirping of birds it was very quiet and peaceful. We would return if a family visit to Maui was planned again. 13 people stayed and were extremely comfortable. We had a very enjoyable and relaxing time hanging around the pool. Location is great. Hiking, and multiple cool towns very close by. Would come back again!